The Supreme Court dealt President Obama’s order to allow the undocumented parents of American citizens or legal residents a death blow in a Texas case by a 4-4 tie. 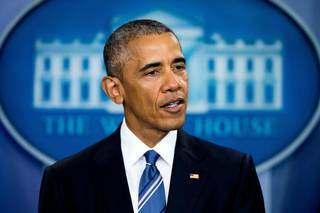 Underscoring the significance of the ruling, a “disappointed” Obama himself went to the White House briefing room to repudiate it, saying that the court could not decide because it was not at full strength of nine justices. He blamed the Senate for failing to consider his Supreme Court nominee, Merrick Garland, to fill the vacancy after the death earlier this year in Texas of Supreme Court Justice Antonin Scalia. The decision was a blow to Obama, all but ensuring that he will leave office in January without resolving what he hoped would be a key piece of his legacy. The Deferred Action for Parents of Americans and Lawful Permanent Residents, or DAPA, would have allowed undocumented parents of children born in the United States or who are legal residents to stay in the country with a three-year renewable work permit if they had been in the United States since January 2010. An earlier program, the Deferred Action for Childhood Arrivals program, or DACA, applies to children brought to the United States without documentation and is not affected by the court case except for an expansion of the work permit to three years from two years. The DAPA order applying to parents, issued in 2014, never took effect. A Texas district court imposed an injunction, and it was upheld by the 5th Circuit Court of Appeals. The decision reflected the split in the Congress and the nation, as well as the presidential campaign, over immigration. Democrats, including presumptive presidential nominee Hillary Clinton, decried the ruling while Republicans hailed it. Clinton tweeted in favor of comprehensive immigration reform. Presumptive Republican nominee Donald Trump’s campaign has centered on controlling illegal immigration. Texas Republican Gov. Greg Abbott, who led the fight against the order when he was attorney general, said in a statement, “The action taken by the president was an unauthorized abuse of presidential power that trampled the Constitution, and the Supreme Court rightly denied the president the ability to grant amnesty contrary to immigration laws.” Texas led the challenge to the order and was joined by 25 other states. “This is personal,” said Saenz. “We will remain at the front-lines, committed to defending the immigration initiatives and paving the path to lasting immigration reform.